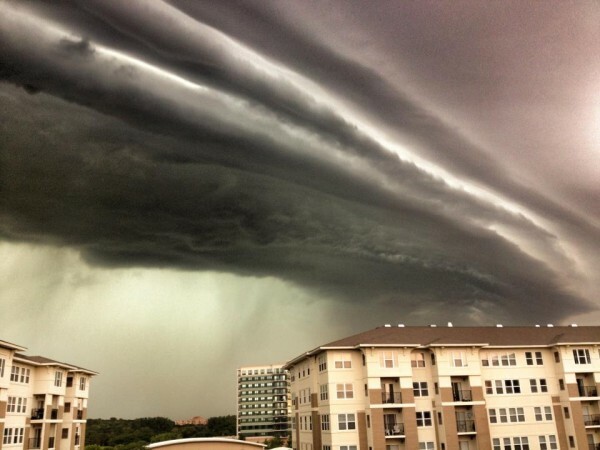 Astonishing video and images of a dangerous storm called a derecho that left Washington DC and parts of the surrounding region in a state of emergency yesterday. 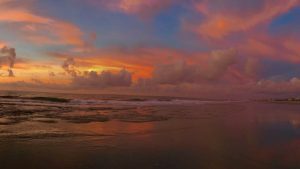 On June 29, 2012, a violent wind storm system – called a derecho – advanced eastward across Indiana, Ohio, West Virginia, Virginia, the District of Columbia, Maryland, and in parts of New Jersey. It produced hurricane force winds that gusted as high as 91 miles per hour in Fort Wayne, Indiana. Millions of people were left without power as trees snapped on power lines. The Storm Prediction Center (SPC), reported nearly 800 wind reports from this derecho. Virginia Governor Robert F. McDonnell declared a state of emergency Saturday, June 30, 2012 – which also affected Washington DC – after the storm devastated the region. In fact, McDonnell announced that the derecho that pushed into Virginia made it the largest non-hurricane power outage in state history. As of now, at least 13 people are known to have died from this destructive storm system, with six deaths reported in Virginia, two in New Jersey, two in Maryland, one in Kentucky, one in Washington D.C., and one in Ohio. As of 5 p.m. EDT on June 30, 2012 (21 UTC), at least 1.6 million people were still without power, which is bad news because residents in these areas are experiencing hot temperatures over 90°F. Check out these images and videos from this destructive and deadly derecho event. Timelapse of closest NEXRAD base reflectivity of the 29 June 2012 derecho. The timelapse moves from Davenport, Iowa to Richmond, Virginia over 14 hours. Amazing footage of the derecho pushing through Charleston, West Virginia on June 29th, 2012. Fun/interesting fact: Did you know these storms actually created an outage of Amazon’s Elastic Compute Cloud in North Virginia which took down Netflix, Pinterest, Instagram, and other services a little after 9 p.m. EDT on June 29? 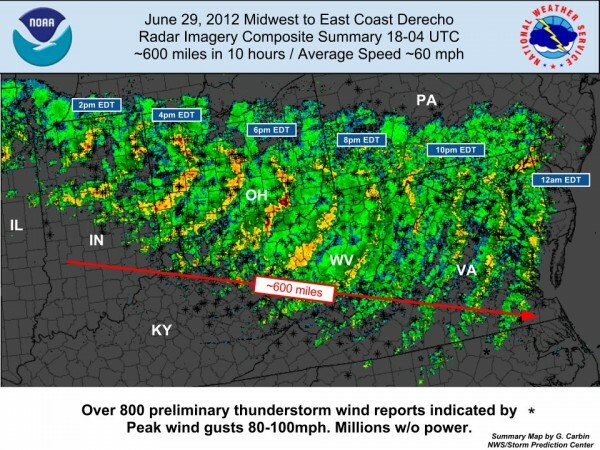 Bottom line: A very strong and destructive storm called a derecho produced widespread wind damage all across parts of Indiana, Ohio, West Virginia, Virginia, Maryland, and parts of New Jersey on Friday, June 29, 2012. Winds gusted over 70 mph in many areas and resulted in widespread wind damage with trees falling on vehicles, power lines, and houses. 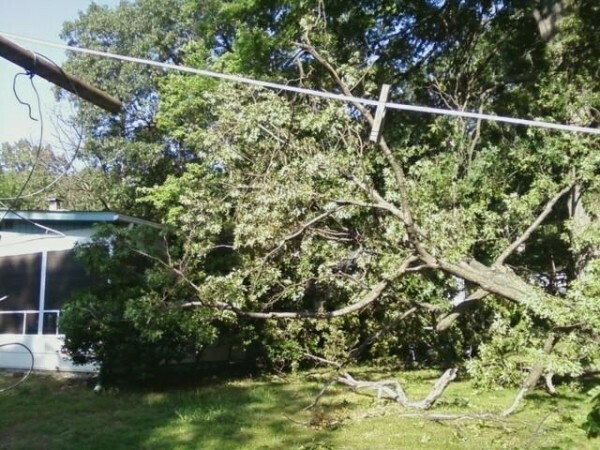 Millions of people were left without power, and some areas might not be able to get their power restored until after July 4, 2012. This system developed early on June 29, 2012 in the late morning hours and continued for over 12 hours. 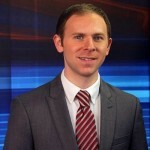 The derecho was likely very powerful thanks to the above average temperatures being experienced across the area, which act as fuel for this system. The strength, speed, and the longevity of this event is what will make this derecho memorable for years to come as so many people were affected by it.